Convenient, easy to use, comfortable and more than ideal for the lone guest, the Jay Be Single Folding Bed is definitely an opulent solution for guest rooms. So if you’re looking to give your guests something to talk about in the morning, then look no further than the JAY-BE Single Folding Bed. So, why should you never buy a single bed even if you’re actually single? Because while you might sleep alone most of the time, you definitely don’t sleep alone all the time, am I right? But for your guests, friends, and that one relative who’s always dropping in unannounced, then nothing works better and impresses more than the Jay Be Single Folding Bed. Quick; how many of you here have an old air mattress that you always pop out when company comes over? If your hand is up, then chances are that no one visits you anymore. I’m always hosting guests or having family over, and the last thing I want is for anyone to question my hospitality. That’s why I decided to send my guests to sleep in true style and comfort with this particular folding bed. The Jay Be Single Folding Bed offers innovative comfort, space savings and all this with the luxury of a memory foam mattress. But it’s the ability to fold in half that really impressed me. I don’t have a lot of space in my home so I just fold it and store it under another bigger bed. Once unfolded, you immediately notice the robust steel frame. It’s British made with a lifetime guarantee. Similarly, the frame incorporates an FSC certified supportive sprung slatted base to add to the overall support. But it’s the mattress that really takes the cake on the single bed. JAY-BE makes use of a pressure relieving memory foam mattress. This mattress combines rebound foam with a top layer of viscoelastic memory foam to give you personalised pressure relief while you sleep. The headboard was a nice extra touch that really balances the bed and keeps you centred through the night. 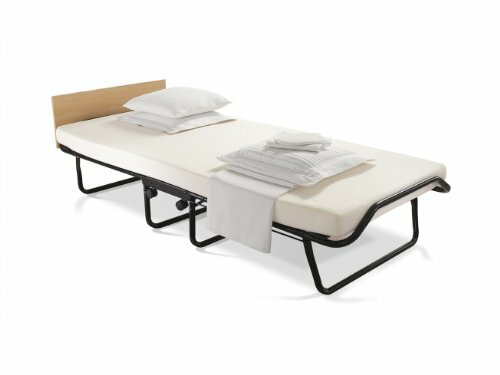 When looking for adjustable, folding or airbeds, I always make sure that they are extremely easy to use. That’s because the more user-friendly they are, the easier it is for new guests to use them. The Jay Be impression Single Folding Bed did stand out for its ease of use. For one, the quick folding system allows it to take as little space as possible. This includes fully automatic folding legs that either open or close in seconds. When folded, moving the bed from room to room is a breeze. The manufacturer was thoughtful enough to incorporate castors that spin at a 360-degree angle for smooth and easy manoeuvrability. All it takes is a little unclipping to unfold the bed, and the fully automatic legs will handle the rest. Now, while the frame is incredibly robust and should be able to handle even my heaviest guests, there is something to be said about the mattress. Yeah, the sprung slats do make for one heck of a smooth ride, but I’m concerned just how long the mattress will last given the regular use. Not many reviews will tell you this, but I’m not exactly shy. Now, the Jay Be Single Folding Bed is labelled single for a reason. Sure, there are times when you have too many guests and they have to share a bed; but I wouldn’t recommend you turn this into a habit. And as if the extra weight wasn’t enough, I also wouldn’t recommend any jumping, bouncing, heavy sitting or extremely rough activities on this bed. Too much roughhousing could cause the sprung slats to dislodge, so try to take it easy. Convenient, easy to use, comfortable and more than ideal for the lone guest, the Jay Be Single Folding Bed is definitely an opulent solution for guest rooms. Sure, the space might be at a minimum while the mattress density isn’t built for regular use. However, it’s better than grabbing some zzz’s on the couch or inflating an air mattress. The supportive sprung slatted base combines with the viscoelastic memory foam for more comfort and support while the headboard adds an extra touch to make it look and feel like a standard bed. So if you’re looking to give your guests something to talk about in the morning, then look no further than the JAY-BE Single Folding Bed.